Today, Microsoft announced the new Surface Studio all-in-one desktop, an upgraded Surface Book and another Windows 10 update coming this autumn. Here are all the important details you need to know. Microsoft announced a new update to Windows 10 — uninspiringly titled the "Creators Update" — that will add a bunch of new features aimed at getting creative work done, particularly involving 3D. Specifically, the classic Windows app Paint is getting a huge update that includes support for 3D objects. 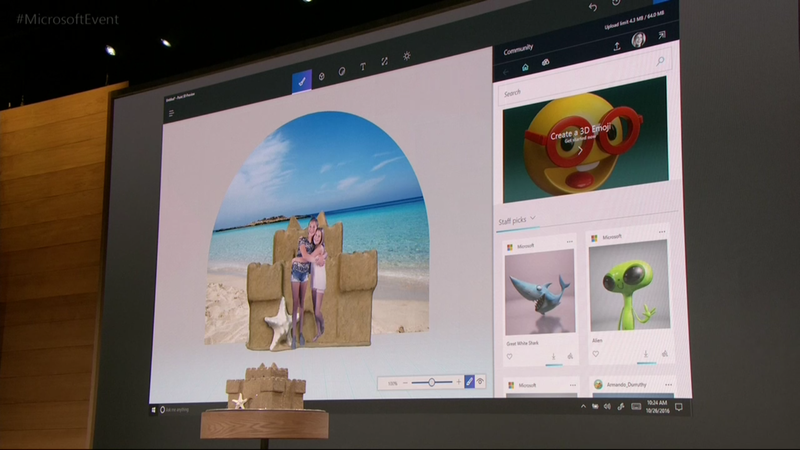 In their demonstration, Microsoft used a camera app to 3D scan a sand castle on the stage. Moments later, they imported the model into the new Paint 3D. They also removed the background from a family photo using a "magic" selection tool, the result of which you can see above. That's photos, selections and 3D objects pulled together in a single app that isn't Photoshop. Not too bad for an program that's normally associated with crappy BMP drawings. Microsoft is also partnering with SketchUp to create a library of 3D models that you can import into a ton of apps like Paint 3D and Powerpoint. You can upload your own objects, including creations made in Minecraft. You can even 3D print the models you find or create. 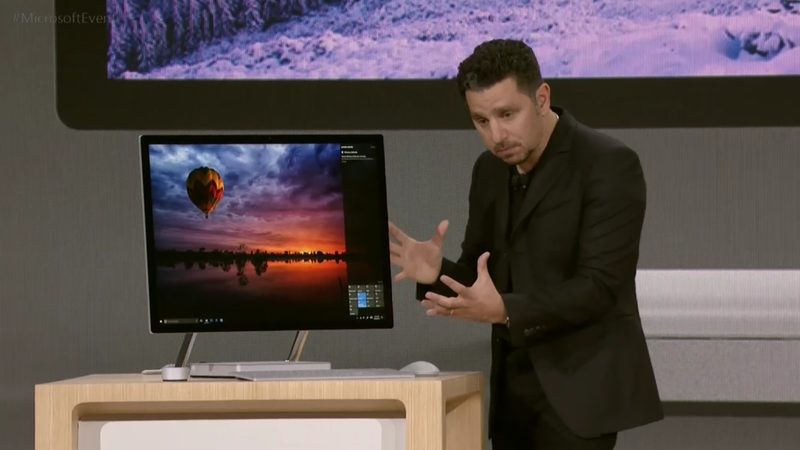 For the first time, Microsoft is stepping into the all-in-one market with the Surface Studio. This device features a massive 28-inch touchscreen display designed for artists and designers. 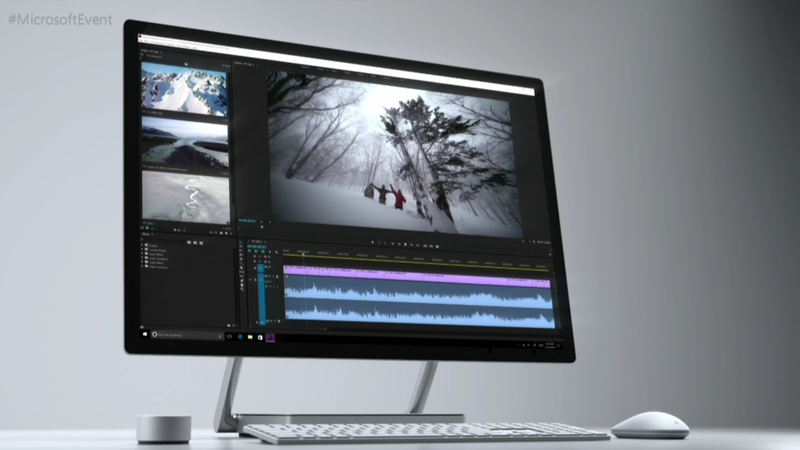 The display features a wide colour gamut and 13.5 million pixels, or "63 per cent more than 4K" according to Microsoft. The screen can be tilted up like a normal display or can pivot downwards to act as a drawing board. You can use the Surface Pen to draw directly on the screen in apps like Photoshop. Microsoft also announced a new peripheral called the Surface Dial, designed for video and audio editors, as well as graphical artists. You can place the dial on the table, or directly on the screen. Turn it to scroll through timelines, or tap it to pull up various tools like a colour picker. Microsoft hopes this will be a little easier than using a mouse for everything. It won't, however, be easier on your budget. The Surface Studio starts at $US2999 ($3922). Of course, if you do creative work every day, you might end up spending that much on a powerful desktop and a drawing tablet already, so it could be worthwhile to get everything in one package. 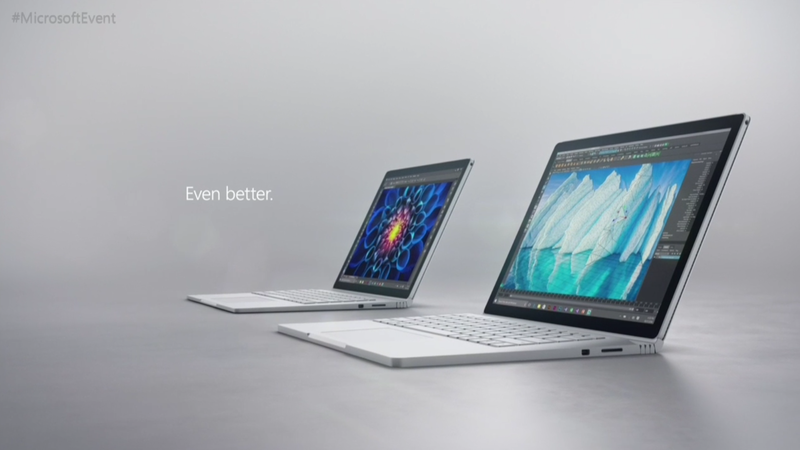 Microsoft's original Surface Book, a high-end convertible laptop, was pretty impressive. Today, Microsoft announced a new version with an Intel i7 processor, and a significantly bigger battery that Microsoft claims can provide up to 16 hours of battery life. The new unit starts at $US2399 ($3137) so it's not for the feint of wallet, but if you're in the market for a powerful laptop-tablet combo, the new Surface offers beefier hardware for the power users. 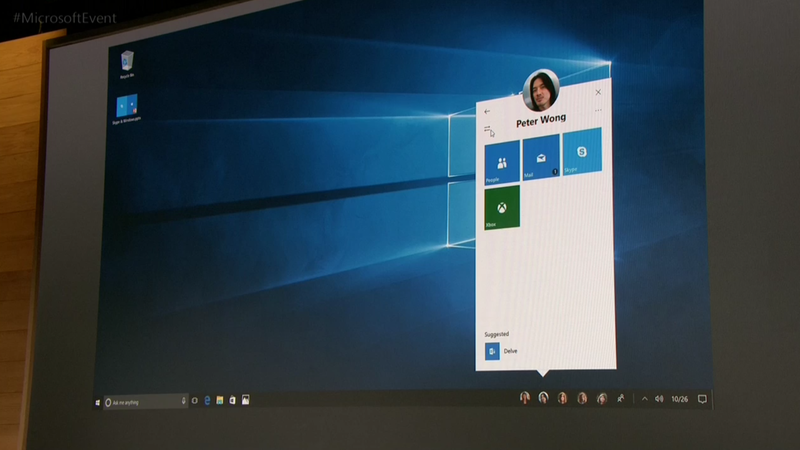 The new Creators Update will also add a 'People' bar to Windows 10. Here, your most frequent contacts will live in your task bar, ceaselessly staring at you from tiny icons. When you want to send them a picture, you can just drag it to their face. Click their icon and you can open your most recent conversation with them. You can also find every app you use to communicate with a person in this menu. Click a person's face and you can jump straight to an email, message, Skype call or any other app that you use to communicate with that person. Most VR headsets like the HTC Vive or Oculus Rift come with huge price tags and require even more investment into a powerful PC. Microsoft wants to dial down the price a bit. 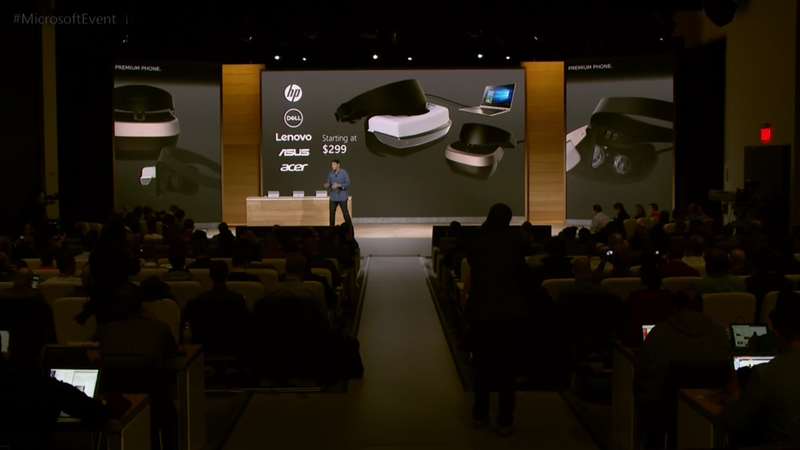 The company announced that it will be partnering with manufacturers like HP, Dell, Lenovo and ASUS will build headsets starting as low as $US299 ($391). Virtual reality differs slightly from the augmented reality that Microsoft has been showing off with its Holo Lens technology, which overlays images on the real world through a transparent display. Some of the new VR headsets may be cheap, but we don't know yet what sacrifices you'll have to make to get the discount. Earlier this year, Microsoft acquired game streaming service Beam. 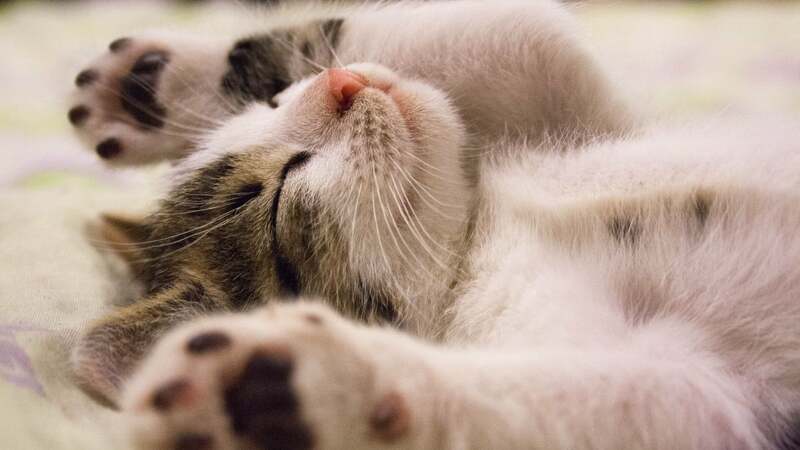 While it's not as big as Twitch, it's going to get a big boost with the newest Windows 10. You'll be able to start a broadcast from the Xbox One or the Xbox app on Windows. 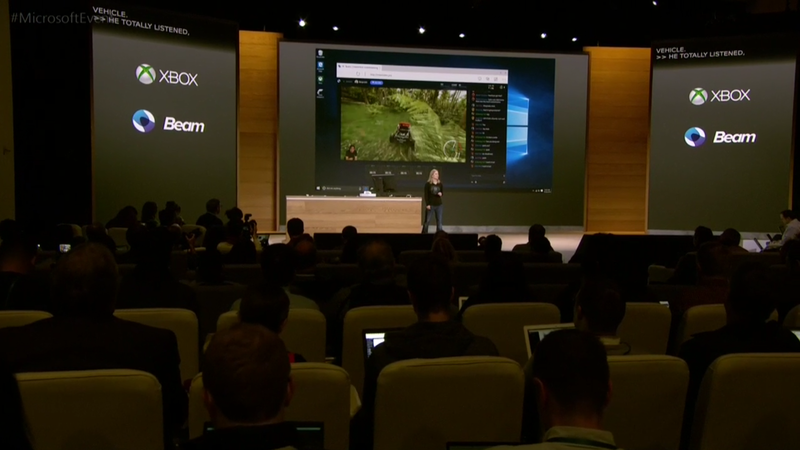 Players will also be able to start their own gaming tournaments and share them on Xbox Live. You'll be able to pick a game, a type of tournament (for example, single elimination) and share the event for later. Looking more like a Mac every day aren't they. Great; now as I enjoy a person moment on RedTube my Mum and Boss will both be staring at me. Now if only they would stop throwing in complimentry information harvesting telemetry in with every program.